This Legion of Super-Heroes post brought to you in part by a little stuffed bull. So I had a few responses to my most recent Answering-the-Question-Time-Post-from-Several-Months-Ago post, but I’m going to focus on a couple of the Legion of Super-Heroes-related comments for today. “A fact that is always overlooked is that, in the Superboy story that introduces the Legion of Super-Heroes, the team consists of more than three members. 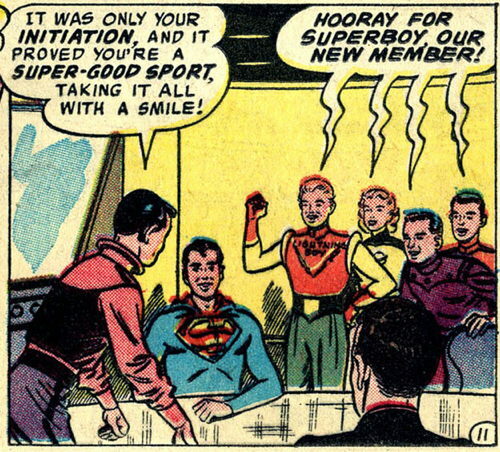 Lightning Boy (not Lad then), Cosmic Boy, and Saturn Girl are the only ones named and clearly shown, but there are a half dozen or so shown from the back, cheering on Superboy’s admission into the team. “For whatever reason these shadowy members were immediately forgotten, and ever after there was a pretense that Superboy was the fourth member. We may be getting a little astray from MrJM‘s original question of “Why a duck Legion?” but this brings up a point I hadn’t really thought about. …or they could be fan club members, allowed to sit in while the Legion conducts business. I mean, you don’t know for sure, right? Now the next Legion story is just Superboy and the original three members (plus a bunch of superheroes from other worlds) and you don’t see new Legion members until the Supergirl story, which is the 3rd Legion appearance. And, to make things confusing, she meets the children of the original Legionnaires Superboy met (who all have the same names and powers), and their teammates Chameleon Boy, Colossal Kid and Invisible Kid, so it’s a slightly more future future than the future Superboy is visiting…but thankfully that particular distinction is dropped and it’s all the same Legion shortly thereafter. 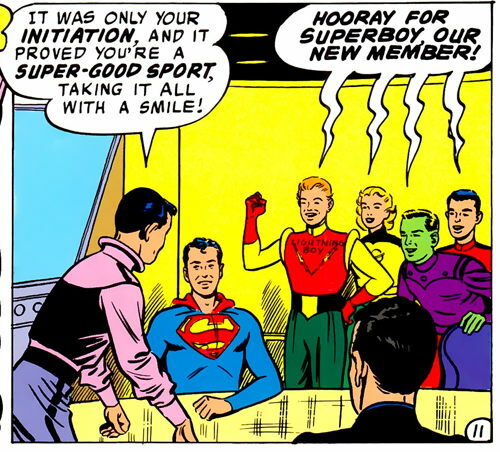 After that it’s another Superboy story just featuring Lightning Lad, and then the Superboy story after that introduces new member Star Boy (again featuring a scene with the original three members and Superboy at a table in front of a room, while we see the backs of heads of other supposed team members). 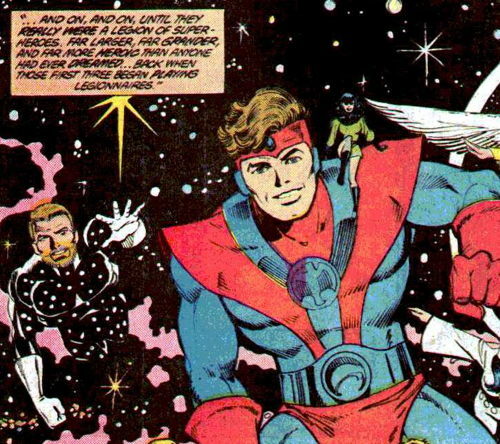 Now, I can’t sit here and read all the Legion stories when I need to go get my beauty sleep, but it looks like at least at the very start of the Legion’s appearances in comics, the team was likely meant to be larger than just the the Main Three we first encounter. If that’s the case, then the term “Legion,” if not technically accurate, is at least a little closer in description to the team in this particular instance. 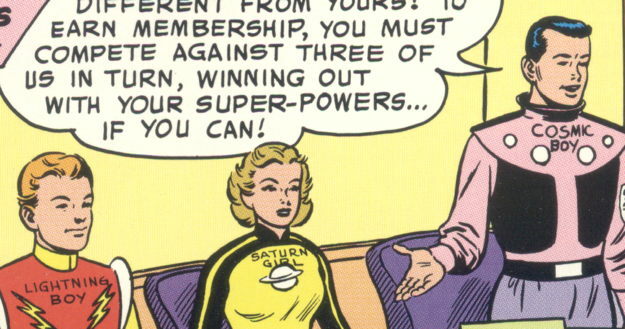 Going back to the Legion’s origin in Superboy #147, it is just Cosmic Boy, Lightning Lad and Saturn Girl at first…who are then joined by Triplicate Girl and Phantom Girl as the next members, and Superboy isn’t shown joining at all just yet. I suppose we can take this as additional confirmation that, at least at this point is Legion’s editorial history, the Legion was comprised of more than just the initial three members by the time Superboy was made part of the group. (That second panel is trimmed a bit for clarity…rest assured there were a whole lotta Legionnaires drawn in there). Anyway, MrJM, I hope that additionally answers your question about why it was called a Legion…or at least muddies up the topic even further. I’m too close to be able to tell, myself. Let’s hope the coming Rebirth revival includes the chest-text. It’s all the rage in the 31st century! 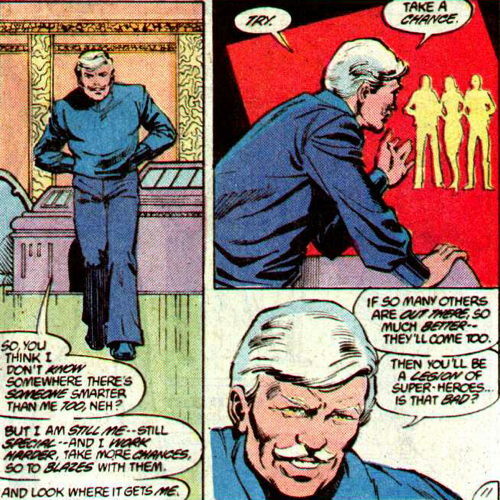 This LSH discussion is well-timed, since I’ve just started running a Legion-themed tabletop RPG. And yes, the question of “aren’t we a few orders of magnitude short of a proper ‘legion’?” has come up. Since I’m using the reboot explanation of “deliberate propaganda to help unite the still-new United Planets,” that helps. It gets even more confusing (how many discussions of LSH don’t have that expression) when you consider that, by the time time it was codified in the 1981 SECRETS OF THE LEGION OF SUPER-HEROES mini-series the third Legion story (Supergirl trying out) and some other later stories actually took place before the first (Superboy joining) according to the Legion’s chronology. Of course, then you have to explain (I think through Saturn Girl doing her voodoo) how Superboy has his memories altered so that he doesn’t know about Supergirl before he finds her rocket as Superman, but still remembers enough to have told Supergirl about the Legion. Also useful later to explain how both of them could work side-by-side with Mon-El, who’s trapped in the Phantom Zone in their time. BobH – Oh, believe me, I could probably spend the next month or dozen trying to puzzle out the Legion continuity. Once things get going, the LSH stories are relatively consistent…at least until the “5 Years Later” era and the retconning really gets going in full force! They recolored the character in the ARCHIVES edition?!? Isn’t that counter to the entire idea of an archive? Or did they use art that had already been recolored before it was in the Archives edition? Daniel T – Some of the early Archives feature touched-up/partially redrawn artwork as well. There’s a great Comics Journal(?) article detailing about how some of the linework in, say, early Actions was lost during the process of prepping artwork, and was “fixed” sometimes to the detriment of the artwork’s detail. I don’t know if that particular example from Adventure #247 was printed in its altered state prior to the Archive edition…I’ll check my Silver Age Classics version when I get a chance. The whole pocket universe idea was so unnecessary. Well, I guess it was necessary in the sense that it gave the company and fans a chance to say good-bye to the Superboy character. But as a plot device it created more problems than the one it solved. Even then, I thought they should have just established that the Legionnaires went in time to meet their inspiration Superboy, discovered he was just a legend when they met Superman, and Superman occasionally traveled to the future to work with the team (for stories where Superboy just wasn’t replaceable or able to be left out). On the other hand, the pocket universe story did lead to LSH #50, which is still one of my all-time favorite superhero comics. Daniel T – I have to admit, the Pocket Universe Superboy seemed like a good idea at the time! I hereby dub the dark-haired guy in the red shirt “Background Lad,” a teen with the power to be unnoticed among groups. He’s actually been a member of the Legion from the beginning, but no one remembers that he’s there (even if his powers make him a great spy). On the one hand, I’d say it’s the Byrne reboot (and subsequent erasure of Superboy) that was unnecessary, especially since nearly all of Byrne’s changes have basically been reversed at this point. On the other hand, his misguided efforts gave us the pocket universe, which led to amazing stories like LSH #50, and the 5YL stories where Mon-El kills the Time Trapper and Glorith rises in his place. A classic example of turning trash into treasure. Thank goodness the Legion creative team could think on its feet and produce such compelling in-universe explanations for all of the ham-fisted changes that were being made to the Superman mythos.